It is possible for other drivers to associate themselves with a Saleae device. This won't necessarily cause problems, but we have seen at least one issue in the past where a conflict prevented proper operation of the device. Also, it's always a good idea to verify that your USB 3.0 host controller drivers are up to date below. We've seen two types of drivers become associated with a Saleae device. If your PC has special "charging ports" please run this test twice - once on a normal port, and once on a charging port. Navigate to the driver tab. Click the button "driver details"
Note the files listed in the "driver files" list. 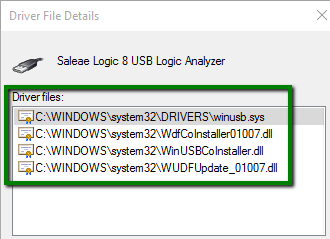 These four drivers are part of the WinUSB driver, which all Saleae devices use on all versions of Windows. Note that 4 files are listed - if not all 4 drivers are listed, that's OK.
Those other files most likely belong to another driver which has attached itself to the Saleae device.